The E. A. Wilson statue (and house) in Cheltenham. Episode: 13. Site Numbers: 004, 023. Date Posted: 29 June 1996. Location: Cheltenham, England. Type: Statuary & Building. The Times once described The Promenade in Cheltenham as "perhaps the most beautiful thoroughfare in Britain." A prominent Promenade landmark is a bronze statue (023) of E. A. Wilson, everyone's favorite Antarctican. Sculpted by Lady Scott--and reminiscent of her statues of her husband in Waterloo Place and Christchurch--it was unveiled by Sir Clements Markham on July 9th, 1914. The following inscription appears on the substantial stone base: "Edward Adrian Wilson B.A. M.B. CANTAB. F.Z.S. Born in Cheltenham 1872. Chief of the Scientific Staff. Artist and Zoologist of the British Antarctic Expedition 1910-1913. He reached the South Pole January 17, 1912. And died with Capt. Scott on the Great Ice Barrier March 1912. 'He died as he lived. A brave true man. The best of comrades and staunchest of friends.' (Letter from Capt. Scott)." 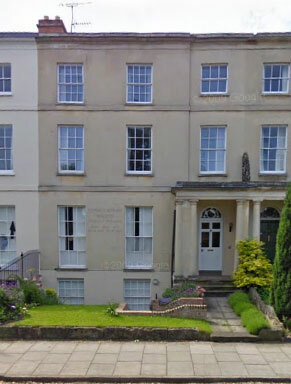 Not far off, at 91 Montpellier Terrace (004), is the Wilson family house. On the ground floor, between the two windows of the front facade, is inscribed: "EDWARD ADRIAN WILSON ANTARCTIC EXPLORER Born here 1872 Died with Scott 1912." The premises are now operated as the 'No 91 Guest House,' appropriate accommodation for any keen Antarctican visiting Cheltenham! There are some other Wilson associated sites in Cheltenham which I'll leave to another time.